ECOVERITAS operates since 2010 under a BREEAM International Assessor licence for New Construction projects and a BREEAM International Assessor licence for Refurbishment & Fit-out projects. It is the first company in Greece to have obtained these licences and implement certifications in Greece and abroad..
ECOVERITAS is a certified and licenced BREEAM In Use Auditor since January 2012. 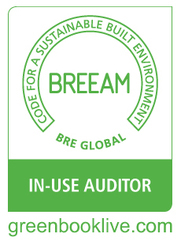 This certification and licence entitles to undertake BREEAM In Use Audits for the issuing of BREEAM In Use certificates for existing non-domestic buildings. The BREEAM AP qualification was granted to ECOVERITAS, in April 2014, for being a suitably experienced construction professional with very good knowledge of sustainable design and the design process. Extra credits are awarded in BREEAM certifications for appointing and using in a project a BREEAM AP such as ECOVERITAS. ECOVERITAS maintains close relations with BRE and is a BREEAM and founding member of the BRE Academy. It participates in various Customer Liaison Workshops and provides feedback for scheme updates. Furthermore, ECOVERITAS is a BRE hosting partner for BREEAM International Assessor training and other courses in Greece. Sustainable Building Council Greece is the official Greek member of WorldGBC. Ecoveritas is a founding member of SBC Greece.